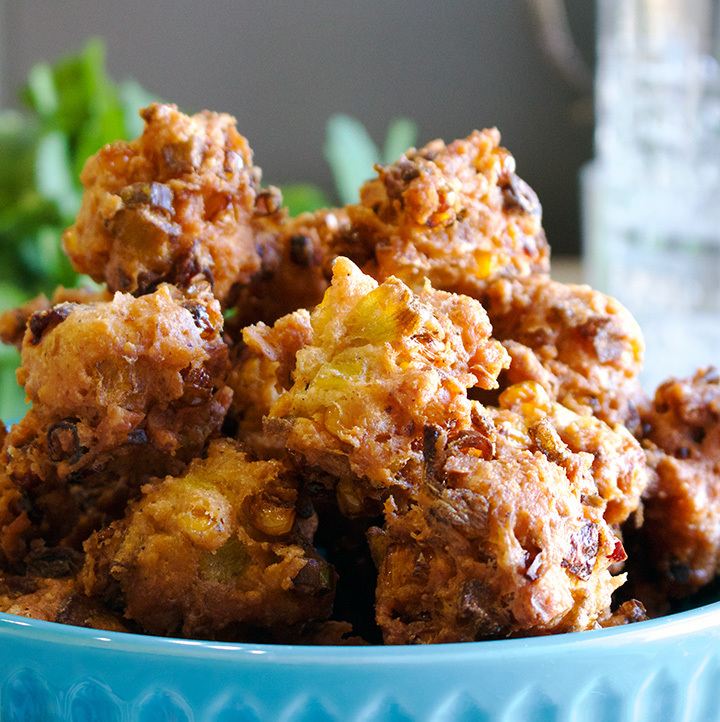 Coconut Corn Fritters with Chipotle Cilantro Sauce. These tasty little coconut corn fritters are packed with chili roasted corn, coconut flakes, green chilies, chipotle peppers, and scallions, fried in coconut oil. 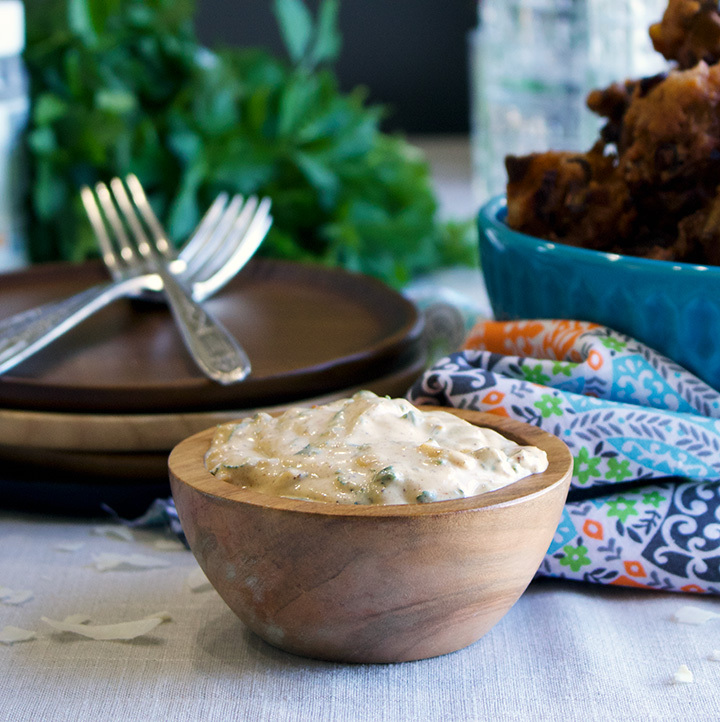 Dipped in a super quick dump-everything-in-the-bowl-and-stir chipotle cilantro sauce, these appetizers are so tasty you may not even need a main dish. As I write this, it’s 14 degrees outside and snowing. I have very warm slippers on my feet, a sweater over my sweatshirt, and I’m still cold. And yet, these little coconut corn fritters with their spicy dipping sauce are making me feel like I’m poolside under a palm tree, sun shining on my face, Pina Colada at my fingertips. 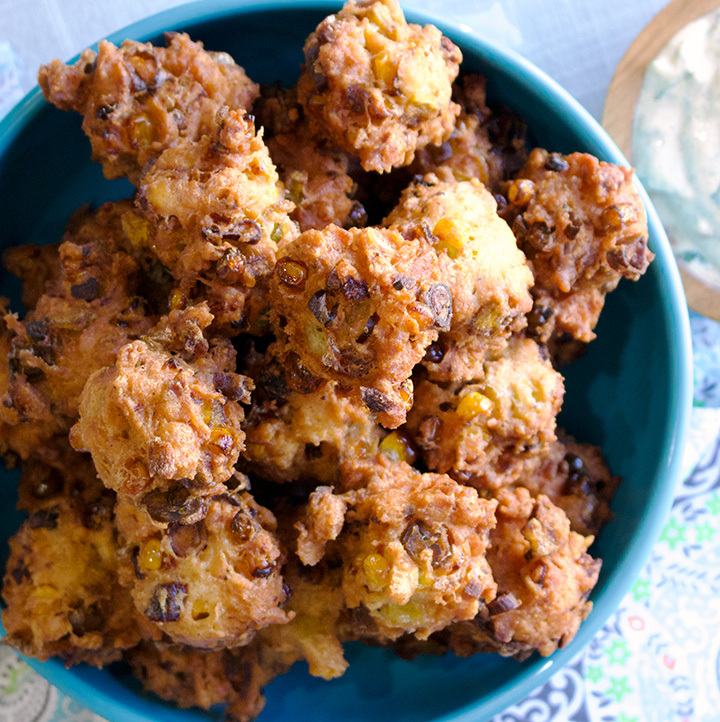 I’m sure coconut corn fritters actually taste better on a tropical beach (how could they not? ), but they sure go a long way towards warming up a cold, snowy winter day in Colorado. And, sometimes you’ve just got to take what you can get. I know for sure that I am going to make these in the summer when fresh corn is at its peak. But, one of the many lovely things about living in the 21st century is that frozen corn is nearly just as good as fresh and available all year round, meaning we can all eat corn fritters in January. Hooray! The trick is to roast the corn with some coconut oil and Tajiin seasoning (or chili powder) before wrapping the tender kernels up in fritter batter. Roasting cooks the corn while infusing it with chili coconut flavor, adding another layer of YUM to simple corn fritters. temperature of the oil really does matter. If your oil is too hot, the outside of the fritters will burn and the inside will still be raw. If your oil is to cool, the fritters will absorb much to much oil and end up as a soggy, greasy mess. I LOVE using coconut oil to fry these little fritters, but it will start smoking at 350 degrees. 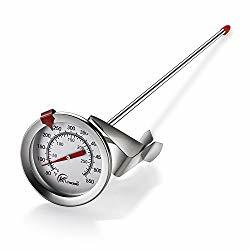 So, do your best to keep the temperature of the oil as close to 325 degrees (F) as you can – the optimal temp for non-greasy crispy fritters that are cooked all the way through. 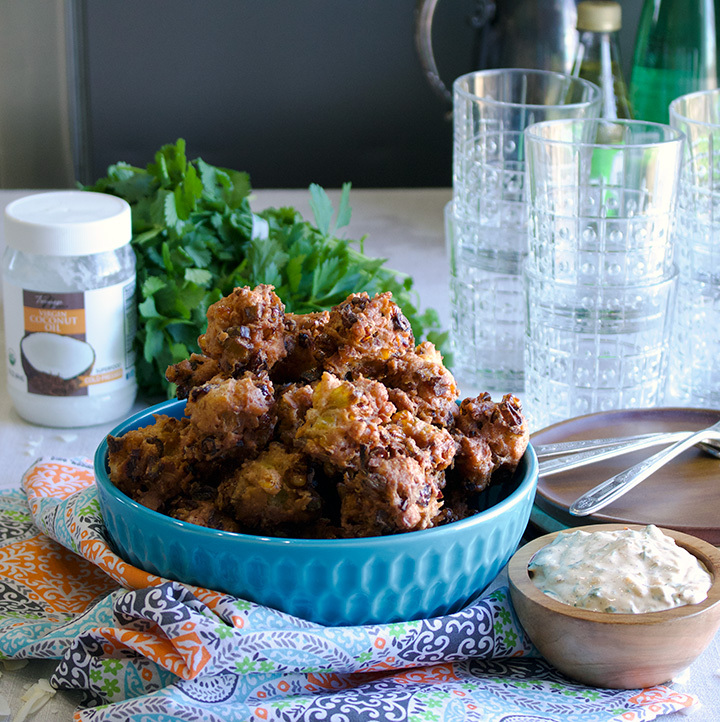 I used TresOmega Organic Virgin Coconut Oil for these fritters – both in the batter and as the fat they are fried in. You’ll find it online at Sam’s Club. Find out more about TresOmega organic products on their website: tresomega.com. Follow TresOmega on Facebook and Twitter. 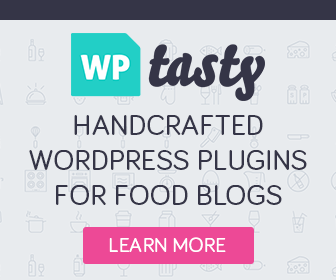 This recipe makes quite a bit of sauce and when you first mix it up, you might be thinking that it’s too much sauce. It probably won’t be. 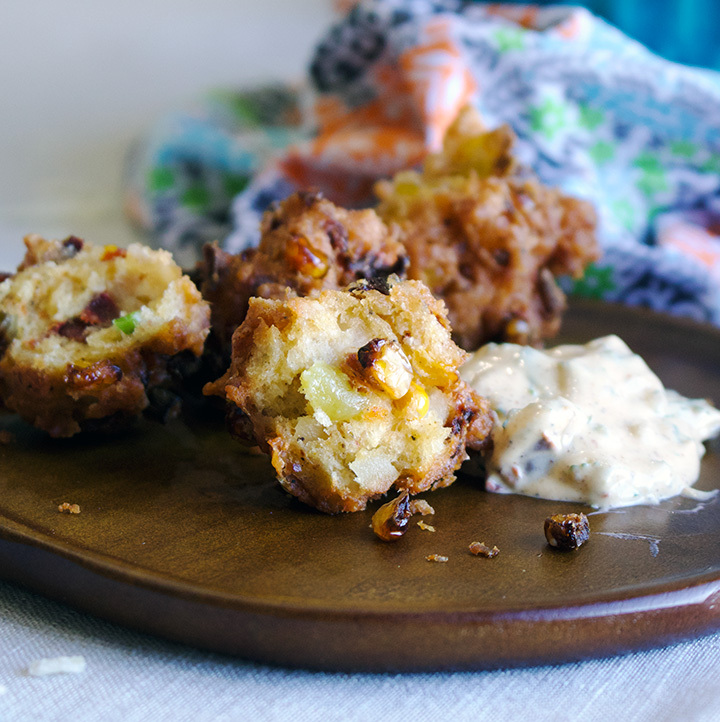 Everyone you serve these to will likely dip the first bite of their fritter in a dainty, polite amount of sauce, but then the next bite will get completely dunked. 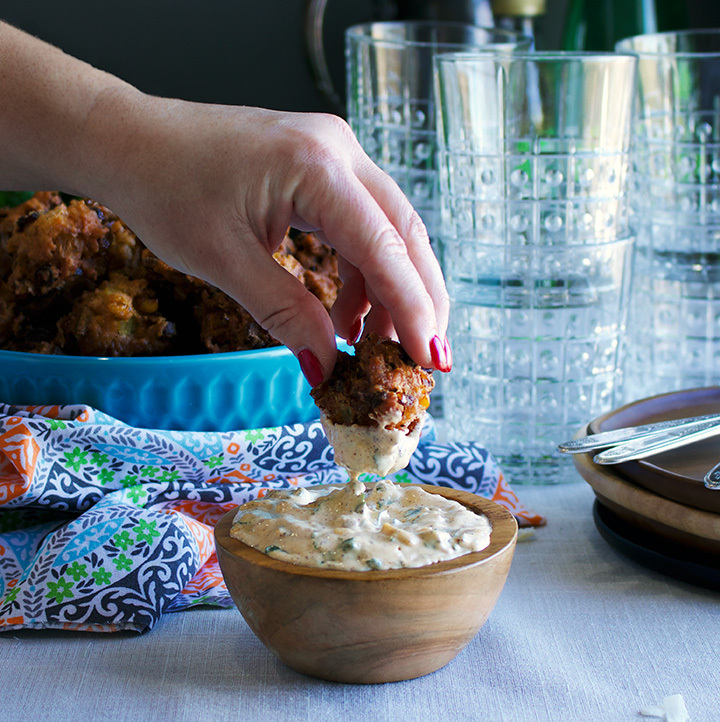 So, you’ll want to provide your guests with ample amounts of sauce in which to dunk (er, dip) their fritters. Add all ingredients to a bowl and stir to mix. Taste and add more chipotle peppers, salt, pepper, or lime juice if desired. Cover and refrigerate until ready to serve. Heat the oven to 400 degrees. Toss corn with 1 tbsp melted coconut oil, Tajin seasoning, and 1 tsp each salt and pepper. Spread the kernels out onto a baking sheet and roast for 15-20 minutes, until tender. Remove from the oven, scoop the kernels into a bowl and let cool to room temperature. Put the coconut flakes into a food processor and pulse 3 or 4 times to break them up into small pieces. Dump the coconut flakes into a bowl and add the flour, baking powder, sugar, and 1/2 tsp each salt and pepper. Stir with a wire whisk to blend. In a separate large bowl, whisk the diced chipotle peppers, eggs, coconut milk, and 2 tbsp melted coconut oil to combine. Using a wooden spoon or rubber spatula, stir in the corn, scallions, and green chilies. Add the dry ingredients and stir just to mix. 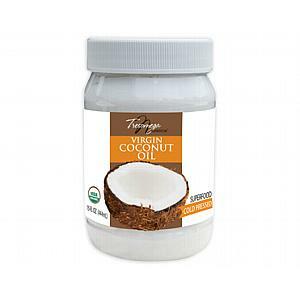 Add 2 cups coconut oil to a medium size saucepan and set it over high heat. (There should be about 3 inches of melted oil in the pan. Add more if necessary.) Heat the oil to 325 degrees. As you cook the fritters, do your best to adjust the burner temperature so that the oil stays as close to 325 as possible. Drop 1 tablespoon of batter into the hot oil and let it cook, turning it with tongs a couple of times, until it’s deep golden brown on all sides. Remove from the oil to a plate lined with paper towels. Taste, and add more salt to the fritter batter if desired before continuing. Working in batches, cook the rest of the fritters: drop batter in tablespoon size portions into the hot oil, turning the fritters with metal tongs as they cook so that they brown evenly on all sides. The fritters are done when they are a deep golden. Let drain on a paper towel lined plate. Do not over crowd the pan. Serve the fritters as soon after frying as possible with the chipotle cilantro sauce for dipping. 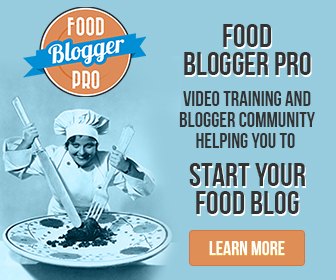 By posting this recipe I am entering a recipe contest sponsored by TresOmega Nutrition and am eligible to win prizes associated with the contest. While I was not compensated for my time, I did receive free product samples. As always, all opinions are my own.